Heat oil in a wok or frying pan and fry the onions and curry leaves and onion seeds for 1-2 minutes. Add the garlic,ginger,chilli powder, salt and ground ginger. Fry for 2-3 minutes. Add the spinach and fry for 4-6 minutes, then add the fromage frais and fresh coriander, followed by remaining red pepper slices. Fry for another 2 mins before serving, garnished with coriander leaves. NB: Fromage Frais – we can’t buy this in supermarkets in Aust, so use 1/2 cream cheese and 1/2 natural yoghurt. 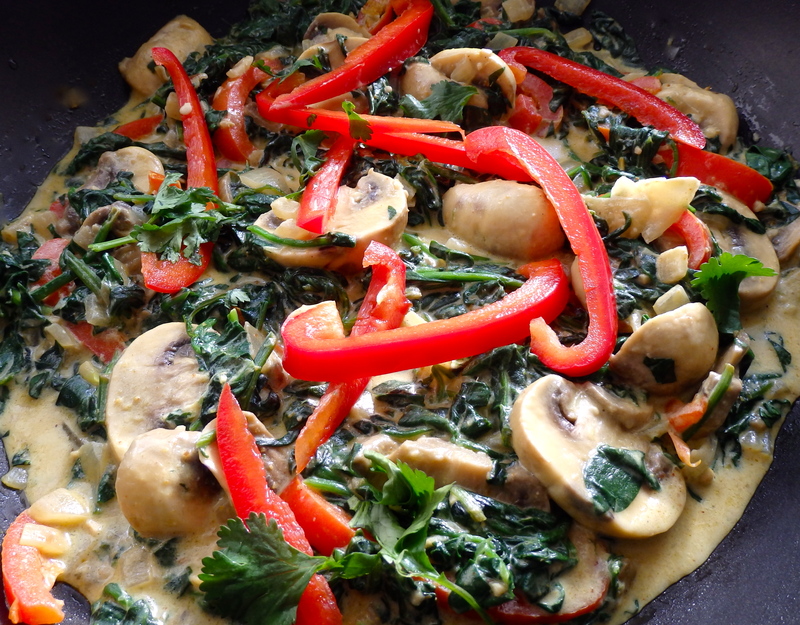 I made this twice – using fresh spinach as well frozen – refer pictures. For an alternate taste i used cream instead of fromage frais.